• Low Profile Pan Head with T-25 Torx Drive. 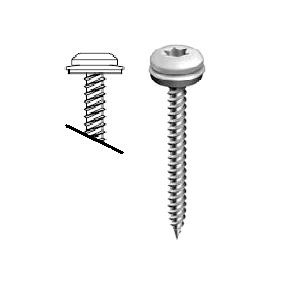 • 9 – 15 screw with Sharp Point. • Self drills through the metal panels up to 24 GA and taps into wood substrate. • Lengths: 1, 1-1/2, 2, 2-1/2, 3"
#8 ID x 1/2 inch OD 304 Stainless Steel Backed Sealing Washer. 20 Gauge 304 Stainless Steel with a Bonded Black EPDM Rubber Seal. 1000/Box. Price/Box.